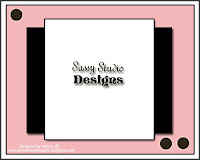 Join me tomorrow for Sassy Studio Designs New Release Hop ...here is little sneak peek of my project.. I'm finally back to YUMMMY part of my Sunday posting...yeah!! 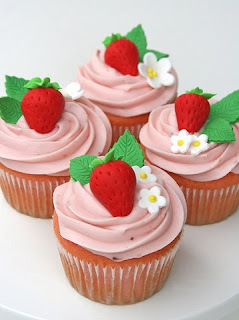 the CUPCAKE INSPIRATION CHALLENGE.. This week we have a very yum cupcake..and here is my card with little sweet something.. The strawberries inspired me to make this cute little Strawberry-like treat holder. I used Cosmo Cricket~ Garden Variety paper...I love this strawberry print on it. A very simple card ..without a stamped image..strange!! me no stamped image..lol...but I really liked this K & Co. chipboard sticker...SWEEEET! !Love the Cosmo Cricket buttons...totally fab ..
Don't just love this cute little treat... 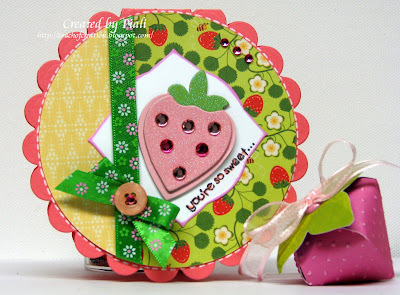 I used Cuttlebug Swiss Dots Embossing folder to make look lot like the real strawberry. I'll share the template with you all soon.. This project is also for.. So play along with us and don't forget to post a direct link to your project .. HERE by Saturday March 6th. 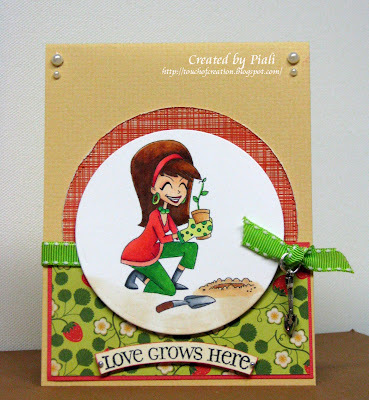 Paper: Cosmo Cricket~Garden Variety from Hope Stamps Eternal, SU, Bazzill. Ribbon, ZVA Creative rhinestones,Spellbinders dies,Cosmo Cricket button. Cuttlebug Swiss Dot Folder. I'm back again with this week's Stamptacular Sunday Challenge.. Create a project that replicates"The Good Old Days". This could be something that looks vintage or includes something that just reminds you of something from many years ago when you see it. 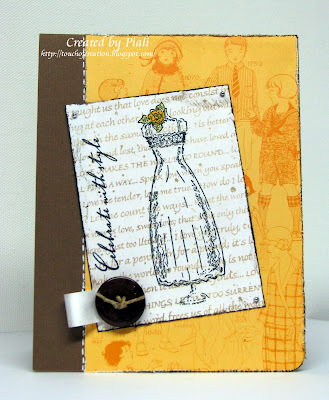 Vintage is not my style..I tried hard to make it ..I used Cosmo Cricket ~ Material girl paper for this card. This week's fab prize is sponsored by our DT sister Sarah..
A fabulous VERVE stamp set.. 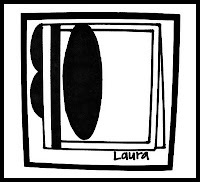 So play along to win it..make sure to post a direct link to your project HERE..
Fun with Shapes and more: Letter/stamp. Template, cardstock, ribbon, Scor-tape, 1/8" hole punch and a Sassy image...I used Sassy March Hare. Print the template on the cardstock.... I always print in on the reverse side of the paper..
Cut it out and score it on the dotted lines.. Apply scor-tape or any strong adhesive on the narrow tab..like this. 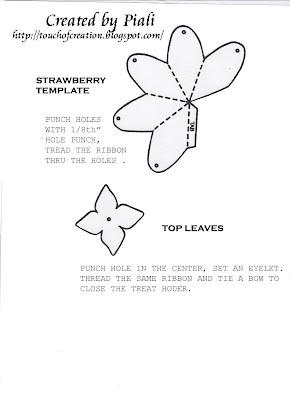 Adhere the ends to form the treat holder and punch the holes using 1/8th hole punch..
Now you have quick and easy Easter treat holder..
Hope you like this tutorial..
We would love to have you play along with us in this tutorial..use this technique, and an SSD image of your choice, make sure to link your your creation HERE by Saturday March 6th. 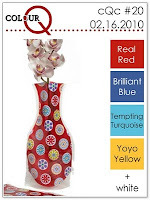 Whimsy Stamps is giving away a $15 Gift Certificate to the lucky randomly picked winner of this challenge! 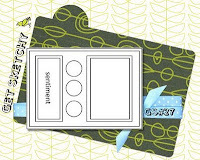 The Gift Certificate can be used at the Whimsy Stamps Store. Pile it On: Lucky Me!! Stamps,Scraps and Doodles: - Sparkle and Shine. 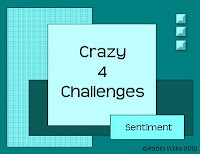 Crazy4 challenges:It's all about Texture!..... 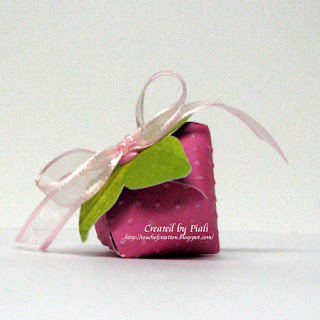 Ribbon, heat embossing, pearls, stitching and texture paper. A Spoonfull of Sugar: Distress inks,Pearls and Glitter...I colored the image with Distress ink. Crafty Catz: A Fancy Edge and a Ribbon. Color Throwdown Challenge: Brown, Pink/white,Olive. Distress ink, Spellbinders dies, Memento Balck Ink, Fiskars Border Punch, ribbon, Recollection Bling and Pearls, Stampendous embossing powder, sewing machine. Today is the Day 6 of ABC Toys and Craft Design Team Birthday Challenge...if you haven't entered the challenge yet..today is the last chance! Here is my Birthday challenge card..I used New Hero Art Monster Fun Stamp set . Love this stamp set..very cute and great for little boy's birthday. So play along with us...link your birthday creation HERE by today @ 12pm CST.Random number generator will be used to pick the WINNER of a $10 store credit to ABC Toys & Crafts store. Offer expires February 28th 2010. Labels: 2s4y, Abc toys and crafts, hero arts. 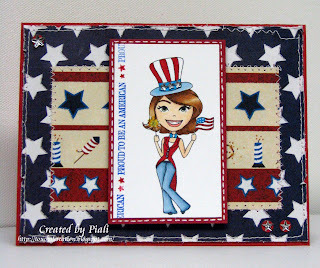 Few fab moments of the week..
Do you remmeber the Get Well kit card..it was one of the Honorable mention over at Just Us Girls challenge ..check HERE. 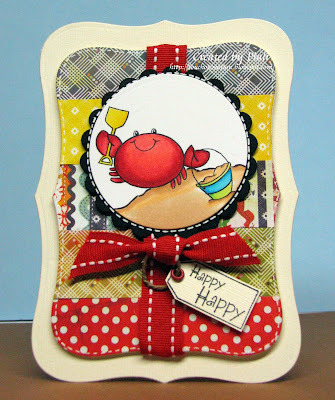 The Cute Crabby card was featured over at Cards Magazine Blog today..check HERE. My Fin-tastic Birthday card made Top5 at Get Sketchy this week..HERE it is. ISS Spring Flowers/St. Patricks Blog hop! 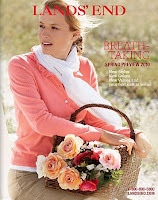 Welcome to InStyle Stamps Spring Flowers/St. Patricks Blog hop! If you are here from Raquel's blog..you're right on track ...if you are just joining me now ,please go to Margie's blog to start so that you don't miss any of these fab creations..
Meet Ginger... planting a tree...Love the ISS retro images..they are just super cute.. Perfect for spring flowers and it will make a great card for Mom..
Its a happy happy card...I used Mercy's sketch for this one. Visit all our Fabulous DT members and enjoy thier creations..leave a comment ..and be sure to head over to ISS Blog to vote for your favorite DT project ...Then, in order to be entered into the drawing to win the Grand prize of surprise basket worth over $50 in paper crafting goodies, leave your name with Mister Linky. You have until 11:59pm EST on Sunday, Feb27th to enter, and the winners will be announced on the InStyle Stamps blog on Monday. Stamp , Scrap and Doodles: Charming. 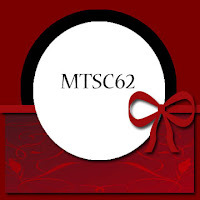 Digital tuesday: Card For Mom. DareU 2 To Digi stamps: Pearls+ digi. Papers: Cosmo Cricket~ garden Variety, Bazzill. Copics, Ribbon, Recollections Pearls, Spellbinders,Charms. 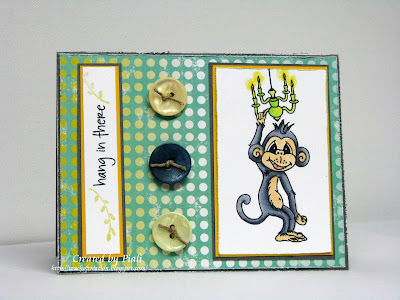 Sorry I'm late with my posting today...due to lots of snow, I had trouble with my internet connections...I'm finally here with my card ..
Fun image is MONKEY LOVIN from The Character Cafe...cute little guy Isn't it??? Quixotic Challenges: One For The Boys . Make sure to stop by The CAFE Blog ..we have a wonderful recipe challenge for you all...check HERE for the deets. The prize for this weeks' challenge is the Ballerina Allison and Lillies images from The Cafe Store, a 15% off Discount Coupon for your entire purchase, a Winner's Blog Badge as well as your blog featured in our Winner's Section of the store . Copics, Papertrey Ink Vinatge Buttons, Twine. I'm back with a super Cuuuuuuuuute Card!!! Love the 2 Cute Rubber Stamps image... Heidi the owner /artist is giving away this FREE digi... she is an amazing artist ..love her cute animal stamps.. I placed the image in an angle so it looks like the happy crabby coming down the sand hill...cute, cute,super cute!!! I used Karen's sketch and colorful Basic Grey June Bug papers for my card today. This week's Cards Blog's challenge is to make different shaped card...so I used Spellbinder's label 8 die for my card base shape. Paper: Basic Grey~ June Bug from ABC toys and crafts, Bazzill. Image: 2 Cute Rubber Stamp. Spellbinder's label 8 ,circle & scallop circle dies, Copics, Ribbon, Spica pen, Twine,White gel pen. Make sure to check the new BIRTHDAY challenge over at ABC Design Blog to win $10 GC to ABC store...for more details check HERE. ABC Toys and Crafts sale is still on..
Its snowing again!!! Schools have ealry dismissal today...a quick post before I head off to the bus stand.. Here is my take on this sketch using new SSD image...Patriotic Patty . If you would like to play along with this challenge...You will have until next Wednesday 3/3, at midnight PST, to get your entry in! Make sure to use a SASSY STUDIO image and link your creation HERE ... A winner will be announced on Friday 3/5 The winner will receive their choice of 2 SSD images!! 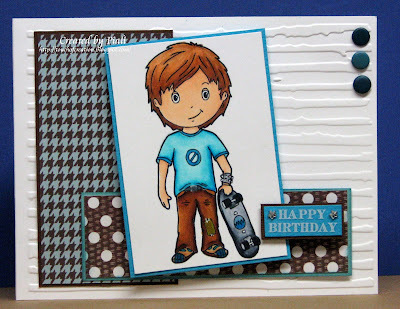 This week Jen challenged us with a lovely Color Combo..
A card for a birthday boy...love this Skater image from Wild Flower Kids. Making a male card is my biggest challenge..hope you all like this one. This card is also for..
Caardvarks: Stuck on You....the sentiment is a sticker.. So Play along with us..make sure to link your entries HERE by next Tuesday Mar 2nd. Stop by the PATCH to checkout the sneak peeks of WFK New Release. Papers: SU, Neenah White, Bazzill. Copics, Cuttlebug distress stripes Emb.folder,Making Memories brads, K & Co. Sticker sentiment. Just Add Ink: Just add Dimension. Paper Cutz: Get well soon. 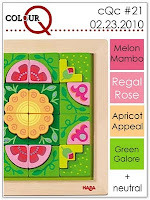 Treehouse Thursday challenge: Paper Piecing. Die Cut R Us:Not so Valentine from Valentine Leftovers...I used MME~ Be Loved papers. Paper: My Minds Eye~ Be Loved from Hope Stamps Eternal, Bazzill , K & co. This is my second post today..time for Stamptacular Sunday Challenge. This week we have a very FUN challenge...one of my faves. include without making it gaudy. Here is my Circle card..
A simple HAPPY card using Hero Arts stamps and a layered punched flower...I love this card..turned out pretty good. 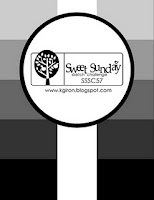 This week we have a fabulous prize from Simon Says Stamps..
$25 Gift Certificate + FREE Shipping! Come paly along with us...make sure to link your entries HERE by next Saturday Feb 27th. 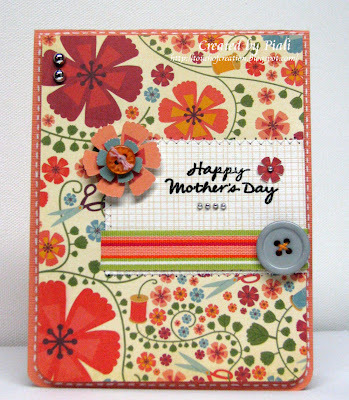 A sweet Mother's day card for today's Cupcake Inspiration challenge CIC47 using the new Cosmo Cricket" Material Girl" paper ...its now available in Hope Stamps Eternal store. Love this line ..very girly with fab flowers...and the gorgeous buttons are from new Cosmo Cricket collections, love the colors. Today I didn't use any stamped image as focal point of my card...but a simple sentiment and cutout flowers from same material girl paper....clean and simple..
Quixotic Challenges: Something for Mum. Raise the Bar: STAMPER NO STAMPING! Paper: Cosmo Cricket~ Material Girl , Bazzill. Cosmo Cricket Buttons, ribbon, Stampendous Black embossing powder,Recollections silver pearls. I have few fab news to share with you all. My tutorials were featured in CRAFT CRAVE today..check it HERE..YAY!!!! Michelle asked me to be the guest designer of PIXIE COTTAGE for the month of March ..I'm so honored. Check back later to see my creations with Fabulous Pixie Cottage stamps..
A WALK DOWN SASSY LANE!! !